Did you all have sweet dreams last night? I know I did. I skipped dinner and ate about 8 fun size candy bars (AND DIDN'T FEEL THE LEAST BIT BAD ABOUT IT.) It's the only night a year that we can justify that right? So do you remember about 6 weeks ago when I posted pictures (HERE) of my disastrous sewing room??? Well, talk about a good kick in the pants. Since then, I've really been motivated to get my sewing room in working order. If you follow me on Pinterest, you know I've been collecting pictures of different ways to organize and decorate my sewing room. 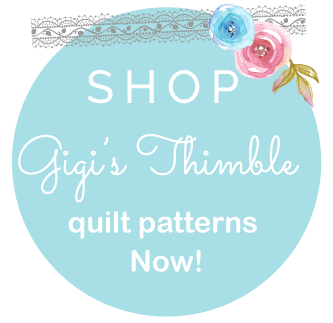 I've been so inspired by all of the wonderful ideas on Pinterest lately that I've just about finished a complete sewing room makeover and have decided to start a new series on my blog called, Tuesday Tips. I'll be sharing some ideas that I've implemented into my new creative space that are sure to keep things cute, organized and efficient. The best thing about Tuesday Tips is that I've asked other well-known bloggers and designers to share bits of their creative spaces with you too ~ right here on my blog! [image found on weheartit.com] Isn't she dreamy??? So first, I painted my walls "Peppermint Patty" by Ace Hardware. Then I went on a hunt for a double wide dresser. I was on a mission. I had one hour to shop before my kids got home from school. I first hit a couple of stores where they sell cute (painted) furniture with lots of character, but quickly realized that they would want about $300 dollars more than I had to spend. So I cruised around the corner to a local thrift store instead. There, I found it. She was a total piece of junk. Some little kid really did a number on her. and part of a leg. It was nothing that a little sanding, wood glue and a few new knobs couldn't fix though. This ugly duckling went from drab to fab for less than $50! 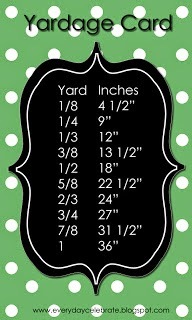 So this is just one aspect of my new sewing room. I love the form and function this piece offers. 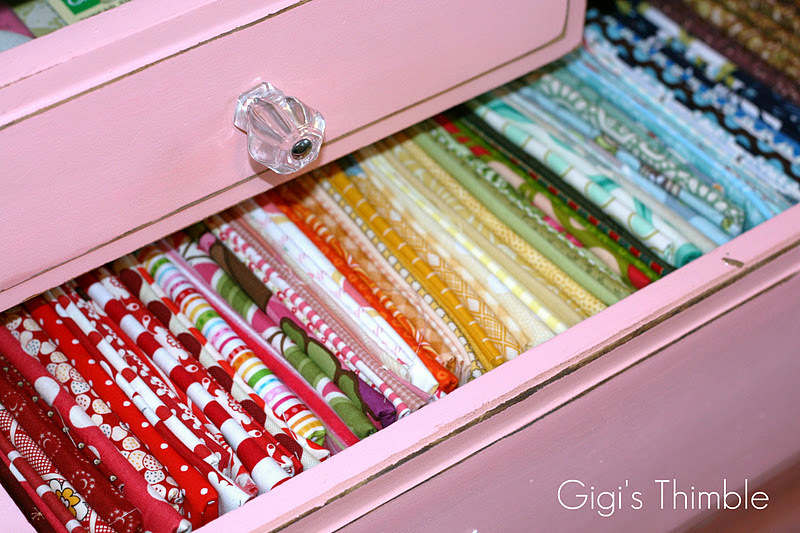 I can beautifully display my scraps and threads on top, while storing away more fabric and tools inside. This was definitely a much needed piece of furniture in this room! 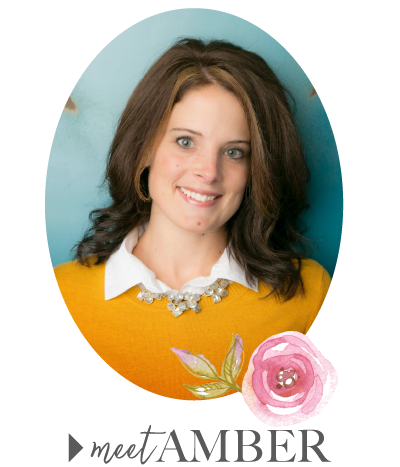 I'll share some more photos from my sewing room makeover with you in the following weeks, but I do hope you'll come back next week for "Tuesday Tips" where Jodi from the blog, Pleasant Home will share with us a little piece of her creative space! I can't wait to see it!!! Fantastic transformation of that old dresser! And great idea for a series of blog posts. I love the big glass cookie jar for scraps. Like the whole idea...love the steps of insperation and before and after on the chest...have an urge to hit the thrift shop!!! one more thought... I use a 30 gallon trash can(on wheels) for my scraps... in assorted color bags... not pretty but real useable. Love what you did!! Great job! Looks amazing! Love the rose message board, too!! 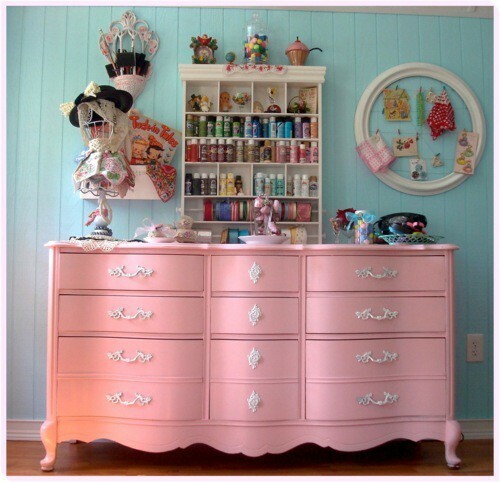 Amazing... hard to believe that gorgeousness was that beat-up, marked-up dresser! Brava! Now I wanna to find me a dresser to fix up!!! Now I totally want to go to Goodwill and find a dresser! GREAT JOB!! Love all the fabric tucked inside. That frame was such a great find! What kind of paint and rollers did you use?? I'm getting ready to do some refinishing projects, so I'd love to know! it looks fabulous, and all done on such a wonderful budget too! What an incredible transformation! It looks awesome. Beautiful makeover! I'm looking forward to your Tuesday tips as well. It's fantastic how you turned that ugly duck in a beautiful swan.Pink is not my colour but it turned out great. 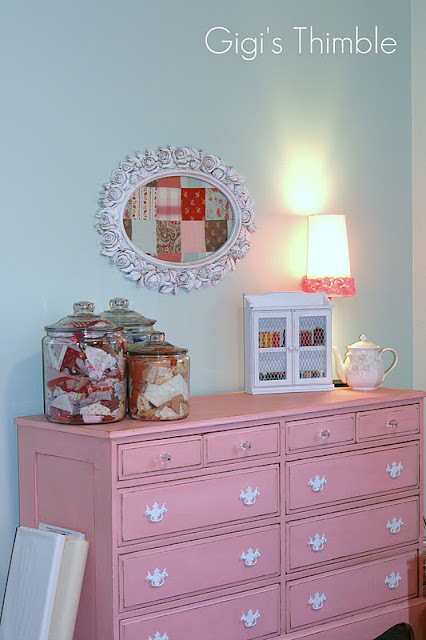 Not only do you have a great dresser-- but a great story to go with it....You don't have to be a millionaire to have a great sewing room. Thanks for sharing. I love the transformation. I'm glad to know I'm not the only one who store my scraps in pretty glass jars. 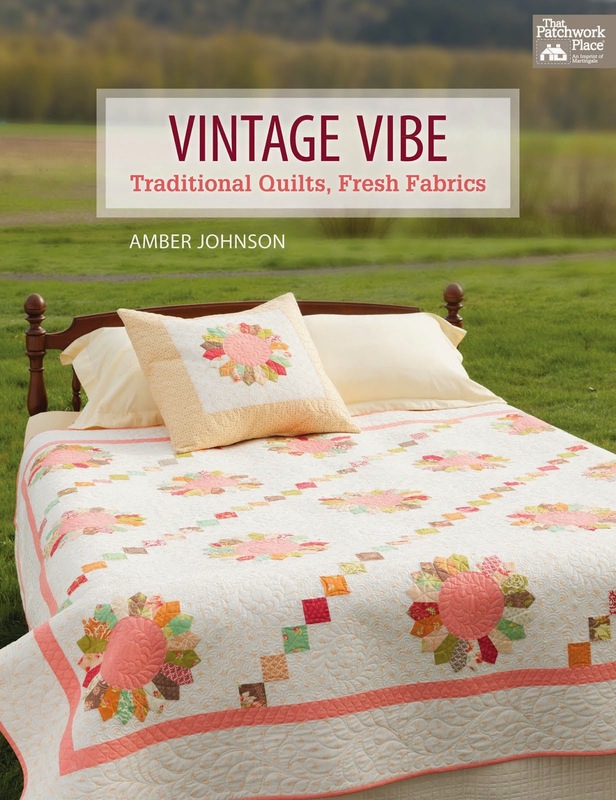 Gorgeous Amber!!! You're killing me!! 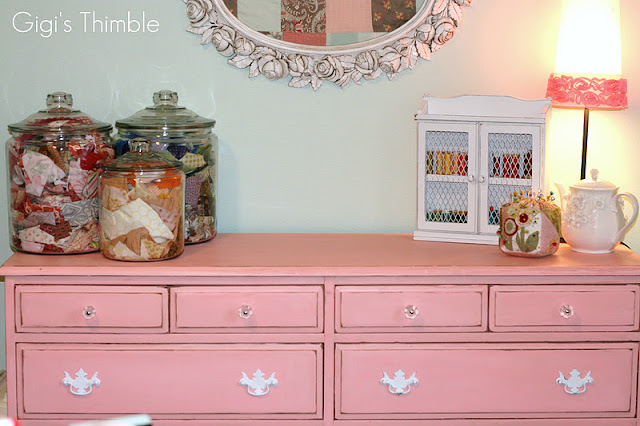 :) I've been on the hunt for a double wide dresser (well I want two really :) Yours turned out AMAZING! Good work! Another grea job, Amber! You always do the best things!